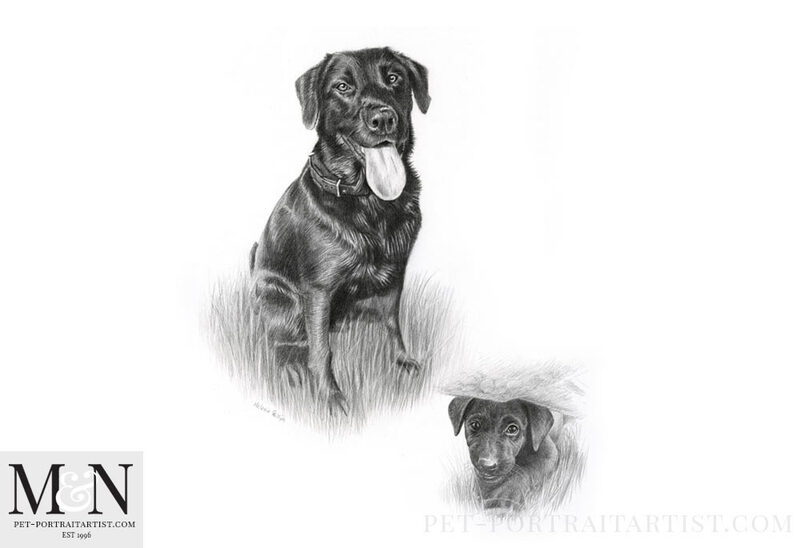 Welcome to my most recent Black Labrador Pencil Portrait for a returning client called Craig (USA). The black Labrador in question is called Zip. Craig wanted a drawing of Zip as an adult and also one has a puppy. Craig had a favourite photo of him hiding under a log in the grass which was perfect. I completed the drawing at 16 x 12 inches and it was traditionally hand drawn by myself. This portrait will match the other drawing I completed of Kirby a few of years ago. 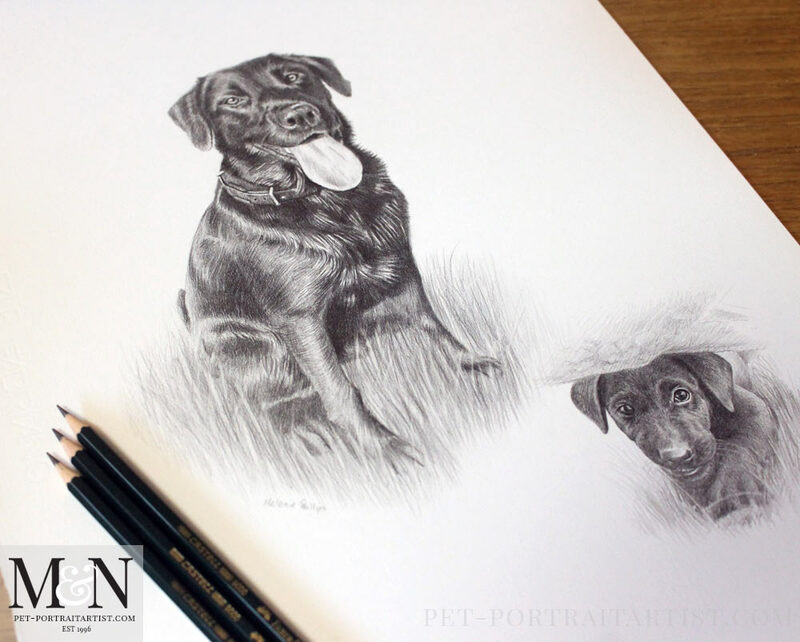 I have drawn a number of labradors over the years for various clients. Not only black labs but Chocolate Labradors and Golden Retrievers too. They work very well in the medium of graphite pencil. They have very classic look to them and fit in any home decor setting. 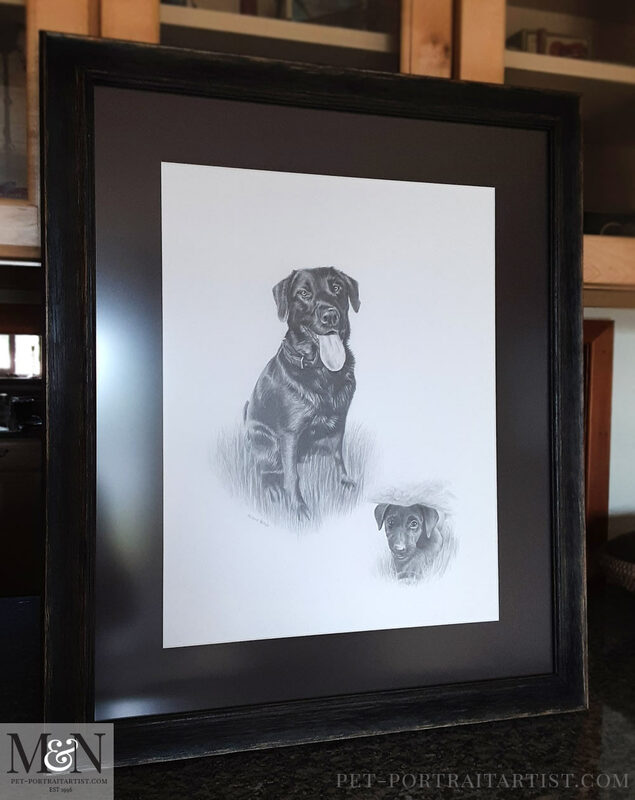 If you would like to commission me to draw your Black Labrador, why not head over to my pencil portraits website and contact me with your photos. Craig very kindly sent this email once he saw the finished scan and photos. 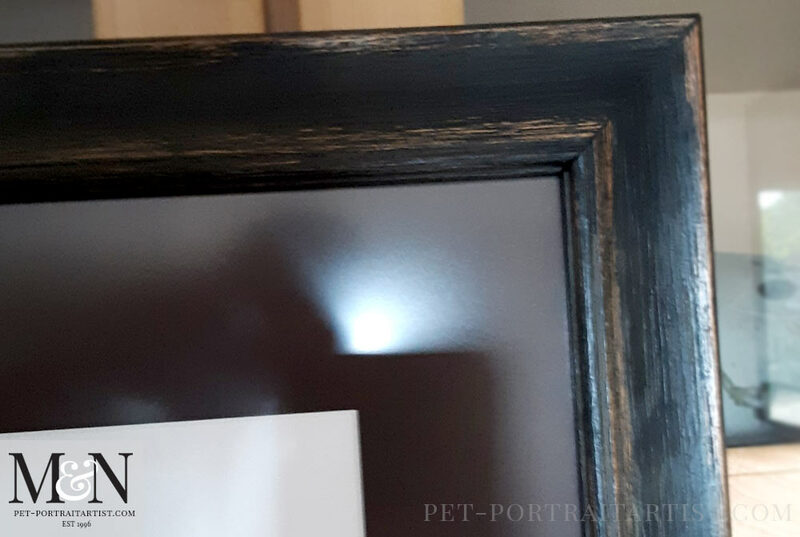 You can also see some photos of the framed portrait, if you scroll down too! I just got your message & looked over the sketch. I like it. For some reason on the puppy image, his goofy little toothy grin is more evident, but as I went back & forth between sketch & the photo that is how he holds his mouth so it is him! I held the laptop screen up for Zip to see – but he was indifferent. I’ll be anxious to see it. The photo of the portrait came out really lovely and I have added it below. The portrait will be heading to the USA very soon and I am looking forward to seeing a photo when it arrives. Craig sent me some amazing photos! The first photo below shows the portrait of Zip framed. 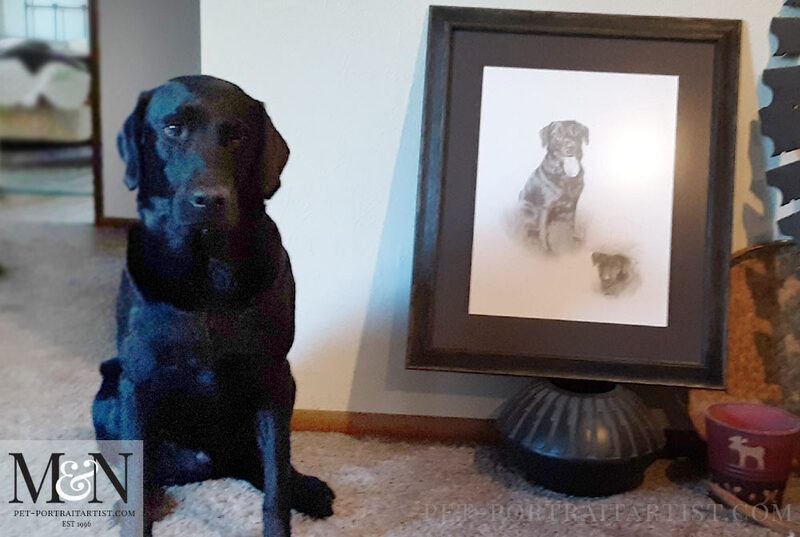 The one below that is a wonderful photo of Zip with his portrait! I really love it when clients take photos fo the portraits, it really completes the whole story and makes it special. 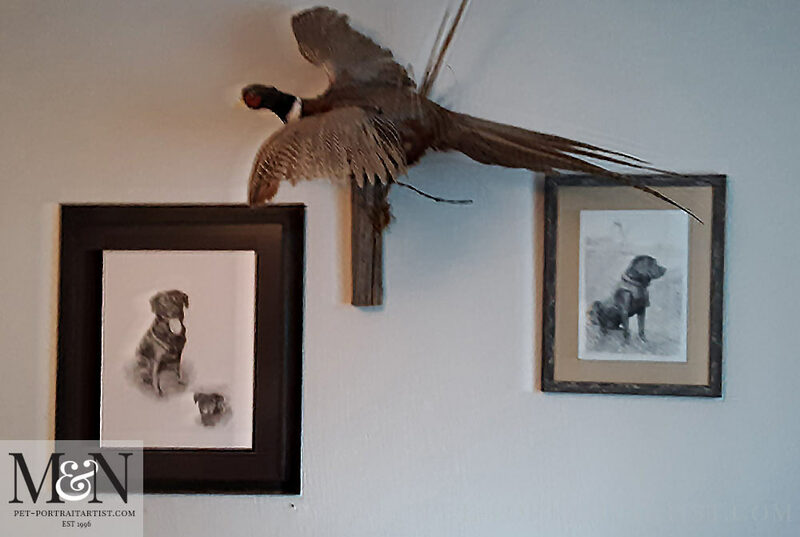 The third photo shows the portrait displayed on the wall along with the other drawing I completed of his previous Labrador called Kirby. I would like to officially thank Craig for taking the time to take the photos and send them to me. Absolutely wonderful – thank you! I hope my readers enjoy viewing them too and I will be adding them to my website in my next round of updates.